As members of The World Foundation for Natural Science we are striving to study the principles of how Nature works, to include scientific research and to put the findings gained into practice in our daily living. From this practical knowledge results a way of life in accord with Nature and her laws. The membership is valid for one calendar year, respectively. At the beginning of each new year we will remind you to renew your membership. The membership can be terminated at any time by written notice to the European Headquarters. Please indicate the family member paying the membership fee. In realizing that mankind has the innate Power to reverse the devastating acts and their impact—primarily of the uneducated man and the money-hungry business world [which controls the world’s money, which the scientists and engineers of the world seek for research grants, to fund projects and develop new ideas or inventions, but which have yet to reach the point where they can be sold to the public for a return on investment] that is killing, slowly and surely and above all inexorably, Mother Earth and every part of life upon the Planet—rendering the waters undrinkable, making the air unbreathable, poisoning the soil, killing the trees, the plants and the flowers, drowning the fish in chemicals, killing the animals in the name of science or for sport, and murdering millions of innocent human beings in the process, I want to help, assist, and encourage, through education and teaching, the immediate world around me. The business world needs the scientists and engineers to give them the new products they sorely need to stay in business, and the scientific engineering world needs the money. And both of these ‘worlds’ within a world control the ‘marketplace,’ and it is these two worlds working together that have become a power unto themselves resulting in the killing of our Planet. 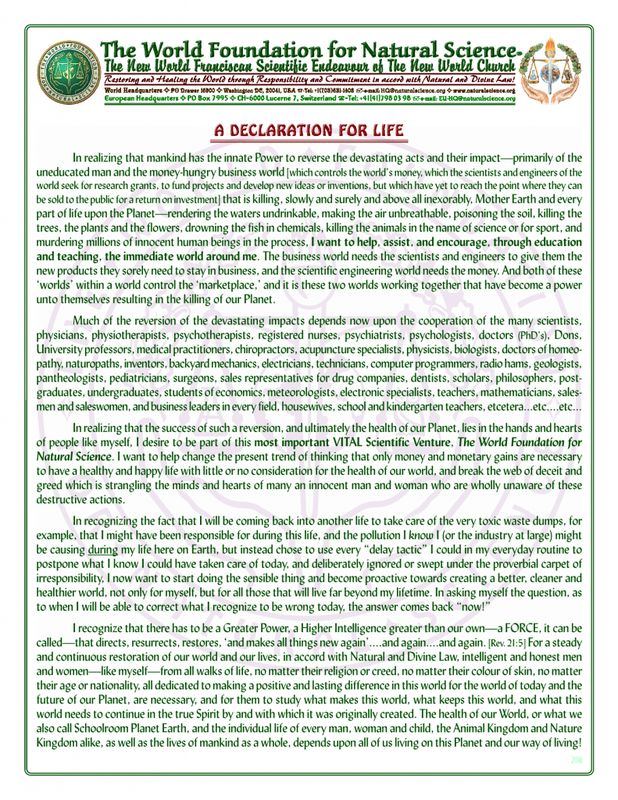 In realizing that the success of such a reversion, and ultimately the health of our Planet, lies in the hands and hearts of people like myself, I desire to be part of this most important VITAL Scientific Venture, The World Foundation for Natural Science. I want to help change the present trend of thinking that only money and monetary gains are necessary to have a healthy and happy life with little or no consideration for the health of our world, and break the web of deceit and greed which is strangling the minds and hearts of many an innocent man and woman who are wholly unaware of these destructive actions. I recognize that there has to be a Greater Power, a Higher Intelligence greater than our own—a FORCE, it can be called—that directs, resurrects, restores, ‘and makes all things new again’....and again....and again. [Rev. 21:5] For a steady and continuous restoration of our world and our lives, in accord with Natural and Divine Law, intelligent and honest men and women—like myself—from all walks of life, no matter their religion or creed, no matter their colour of skin, no matter their age or nationality, all dedicated to making a positive and lasting difference in this world for the world of today and the future of our Planet, are necessary, and for them to study what makes this world, what keeps this world, and what this world needs to continue in the true Spirit by and with which it was originally created. The health of our World, or what we also call Schoolroom Planet Earth, and the individual life of every man, woman and child, the Animal Kingdom and Nature Kingdom alike, as well as the lives of mankind as a whole, depends upon all of us living on this Planet and our way of living! Also read the official membership invitation letter from the European President of The World Foundation for Natural Science and the explanation of the crest of The World Foundation for Natural Science. We believe that an individual‘s most personal and private possession is his or her own name and address, which is why all personal data is treated as strictly confidential, and is not shared with any third party! I would like to subscribe to the electronic newsletter of The World Foundation for Natural Science. Would you like to inform us about anything else? You have chosen credit card / PayPal as your method of payment. After the transmission of the form you will be redirected to PayPal automatically.